I thought I would be alright this winter, and just use layers to turn my summer wardrobe into my winter wardrobe. It's what I've usually done. But this past week I've really struggled making the transition from late summer into autumn / winter. With my trip to the hospital imminent, I wanted to treat myself to some winter friendly items. Off I trot to Simply Be, thinking I would just window shop for the most part. Sera did a great post on her pick of the best quirky animal prints around here, and I lamented that there weren't any available in my size. I know right? Plus size retailers have been spoiling us with on trend pieces lately, that I just assumed this trend would be available in 'size fat'. And when I spotted this little wonder, I threw it over to Sera on twitter to share my wonder at it! I had to have it before it sold out! I had wanted to wear with my green skinny jeans, but the green is more a teal, so wouldn't work well with these. Black skinny jeans it is then!! Sorry for the rubbish photographs, the light was just too bright and I couldn't find a decent angle to get the photo taken!! I've ordered this in a 22, as I wanted a loose and comfortable top which allowed me a number of options. Belted! It works really well for me, with a tan buckled belt. But, as I'm waiting for my operation, and will be sensitive post operation, I wanted a loose top which still looked good without a belt. This will probably be my 'going into hospital outfit, and my 'coming home' one as well. Just with leggings to come home in, not jeans! What do you think of this novelty print trend? Worth partaking in? 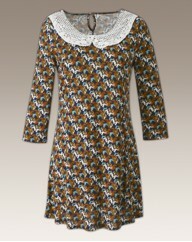 Novelty prints are so cute and loads of fun :) I love the lace collar on this as well.